The phrase curse of knowledge refers to a problem that organizations of all sizes in all industries run into when they try to promote themselves. In the simplest terms, you’ve forgotten what it’s like to be someone who doesn’t already know the great things your theatre and your current production have to offer. You (and probably most of the people you regularly interact with) know a great deal about the work you’re doing, but what does the average person on the street think about it? And are their preconceptions right or wrong? It’s incredibly easy to fall into the trap of marketing to yourself. You pick the poster you like the best. You run with the tagline that makes you smile. That’s not inherently bad, but the problem is most of the people who are really like you are probably already connected to the theatre scene. They probably already know what your show is about and will make a decision about buying a ticket or not based on the people involved and what they already know about the story. But where marketing can really serve you well is when it gets the attention of people who are nothing like you. There is one target market that is nothing at all like most of us, and yet we consistently do a pretty good job of crafting marketing materials that speak to them: kids. I know, I know we’re marketing at least 50% to the parents who are the ones actually buying the tickets – but when my daughter turns her nose up a poster, I don’t cajole her into going to that show. We just find something else to do. The marketing for children’s theatre has to appeal to children, and miraculously it often does! Why? The marketing campaigns aren’t run by children. But the people behind the promotions are really dialing in on what gets a kid excited. Is it bright colors? Simple words that a kid can recognize? I haven’t done any marketing for a kid show, so I don’t know what the details are. The point is people who are trying to market to kids don’t build their marketing around what they like and know. They are able to separate themselves from their experiences and think about how the audience they are trying to reach will interpret the commercials and posters and handouts. It’s easy to wrap our brains around what children might understand and gravitate towards. (And when we get it wrong they aren’t afraid to tell us!) Most audiences aren’t as easy to read. Suppose you are doing a production where you want to target military veterans. Unless you are a vet yourself or very closely tied to a few, you are only operating with a general idea of what’s going to resonate with them. Don’t be general in your marketing! Be specific. 1. 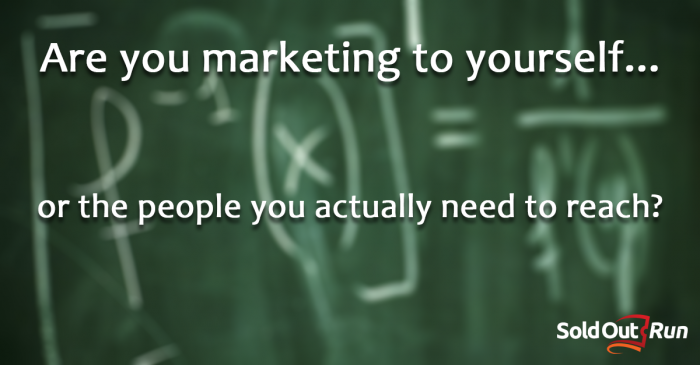 Talk to individuals in your target audience. Get in front of a few vets and talk to them about what they look for in their entertainment. What are the last few plays (or movies or books) they got excited about? You’ll get valuable clues about how to structure your marketing to resonate with them. Imagine your show is about the life story of Joseph Priestley, the man credited with inventing carbonated water. If you find out your target audience refers to their favorite carbonated beverages as “soda”, then your tagline shouldn’t be “the shocking true story of the father of cola.” It should be “the shocking true story of the father of soda.” I’m not suggesting you change the text of the show, but I am suggesting you use the language that makes the most sense to your audience when you’re promoting.